Facebook has consistently been one of the go-to social media platforms for businesses. Although Twitter’s popularity and that of other platforms has put a dent into Facebook’s audience, it still remains one of the top social sites for baby boomers and older generations. If you are a brand whose audience is still using Facebook, you’ve probably realized that competition has stiffened from a content marketing perspective. With so many other businesses on Facebook and the introduction of paid content, it’s becoming more difficult to create content that stands out and sparks a conversation. In order to revitalize your Facebook marketing and grab people’s attention, consider the following social media marketing tips that apply even to other social networks. Content that is relevant and up-to date is far more likely to get people’s attention as it relates to their lives and current situations. For example, holiday-related content and content pertaining to current events tend to perform well in terms of engagement. Developing news stories represent an opportunity to “hijack” stories and bridge the gap between the news and your brand. Sporting events are a common example of this tactic, as companies are currently taking advantage of the NBA playoffs in their content and created similar content for the Super Bowl. Surprising people is another way to spark their interest and to get them thinking about your brand. Creating posts that share interesting facts or industry-relevant information that people don’t know about is a solid strategy for raising a few eyebrows and standing out in people’s cluttered newsfeeds. One brand that is taking advantage of this strategy is Cleveland Brothers, as its content marketing strategy features posts offering users unique and interesting information. For example, on May 5th it shared a post discussing the fact that on that day in history the first American entered space. 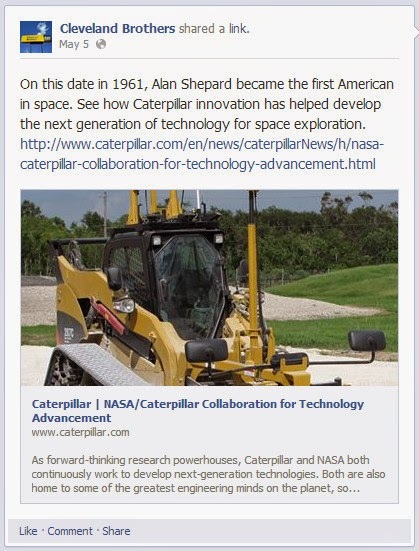 While this information might not be uncommon, the post went on to discuss Caterpillar’s role in developing future space exploration technology, which is probably news to most people. This post exemplifies the way in which Cleveland Brothers draw people in with surprising information while simultaneously raising awareness forits products. Holding contests on your brand’s Facebook page is another example of fun, engaging content that fans tend to enjoy. For instance, Trivia Tuesday is one form of contest-style content that encourages people to interact with your page. Ask fans a fact-based question that prompts them to visit your company page to find the answer. Offering a prize for the winner is another element that helps bring people in, as discounts and exclusive offers are always enjoyed. Facebook’s platform facilitates the sharing of beautiful photographs and visual content, something your brand should definitely be taking advantage of. When it comes to standing out on someone’s newsfeed, a vibrant photograph is much more likely to grab someone’s attention in comparison to a post simply composed of text. These images don’t necessarily have to be photographs, either, as infographics and charts are also intriguing options. Regardless of the style or topic of the post, incorporating images is a great way to get noticed. Competing with other brands on Facebook has gotten more difficult as more brands continue flocking to the platform. In order to create content that doesn’t get overlooked, consider the aforementioned content ideas and strategies.